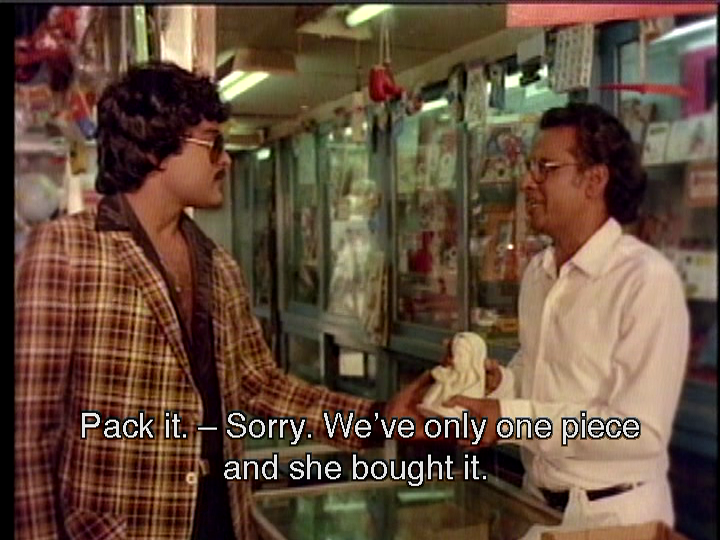 One of the indicators of an excellent masala film is when I could pick holes in it but just don’t want to. 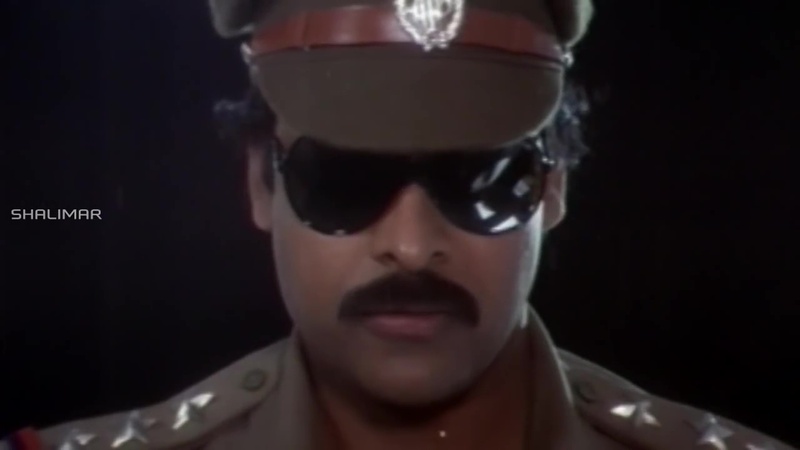 Kondaveeti Donga sees Chiranjeevi teaming up again with director A Kodandarami Reddy in a story by Yandamoori Veerendranath and the result is glorious. It’s so good I want to share every little detail and yet give nothing away so you can enjoy it as it happens. 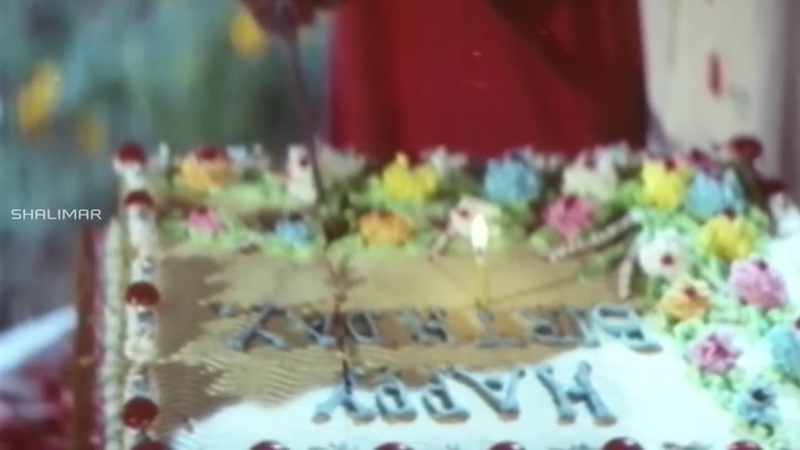 The first 15 minutes is pure breathless insanity and then the film really takes off. 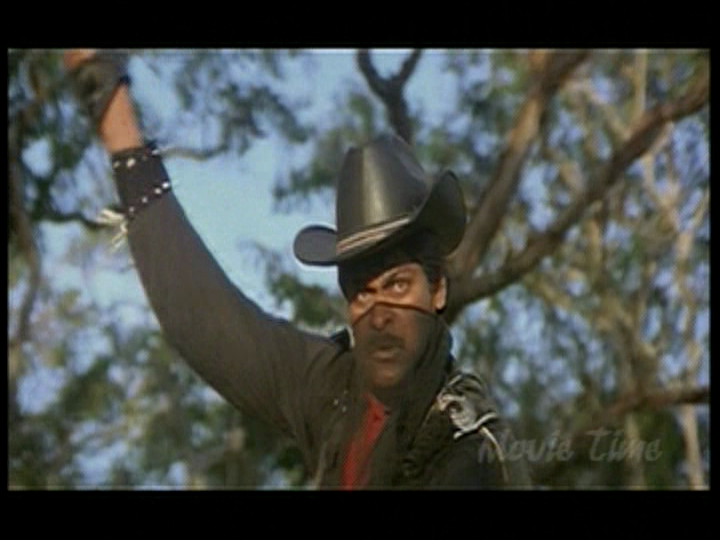 Raja (Chiranjeevi) is a graduate returning to his village home. 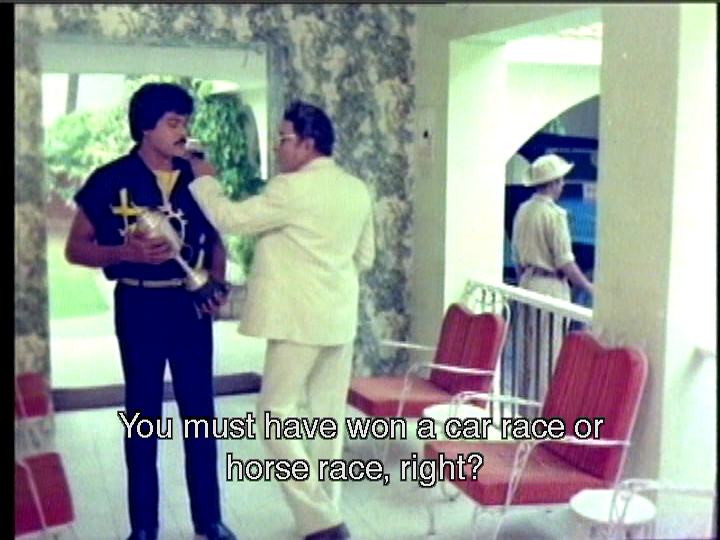 That might explain why the subtitles say ‘coz. He’s so modern and citified. 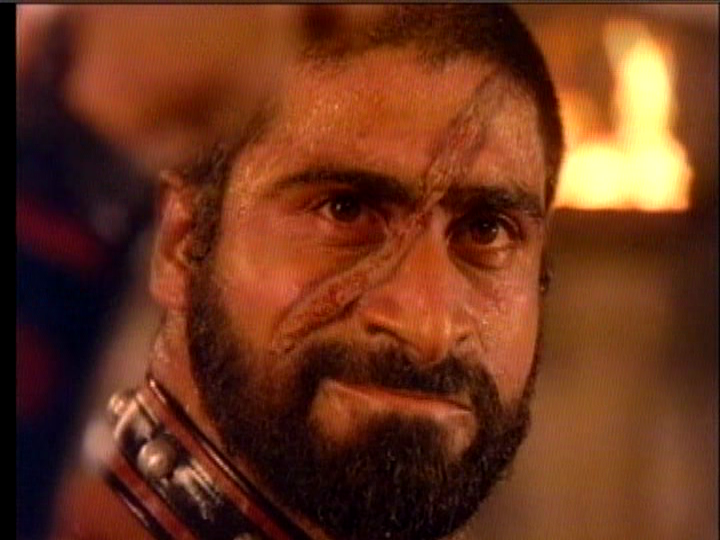 Raja is an orphan, adopted by village strongman Satyanarayana Kaikala. The local people funded his education, and he is back to repay them by working to make their lives better. 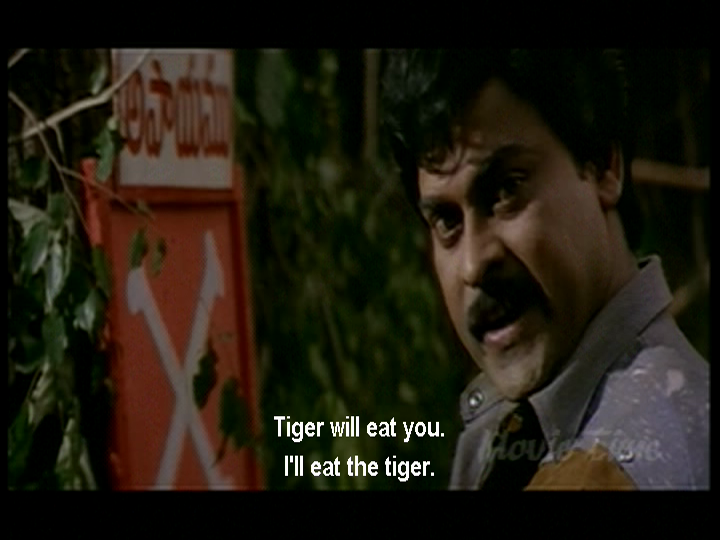 He finds a mysterious tiger reservation has annexed the prime farming land, and the villagers are all in debt to bigwig Rao Gopal Rao and his creepy son Narasimham (Mohan Babu). Raja tries to fight for their rights in the courts but fails. He so disappoints the villagers that one of them drops dead in the court room, adding to the guilt trip. 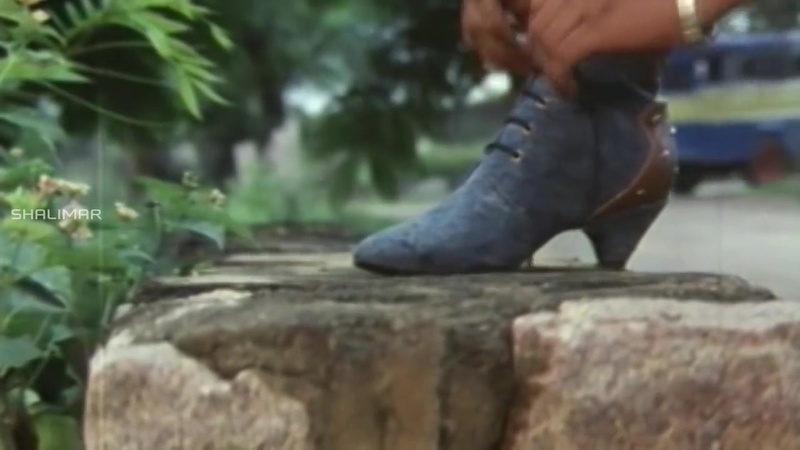 Raja decides he must deliver justice since the law won’t, even though the illiterate villagers were clearly swindled. Inspired by an old story his adoptive father used to tell, Raja becomes the Kondaveeti Donga! 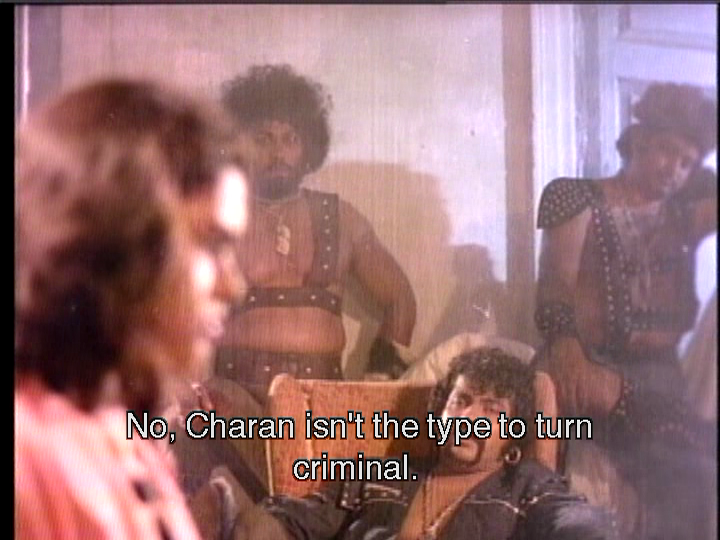 Raja declaims some cracking dialogues and bowls the ladies and bad guys over at every turn. 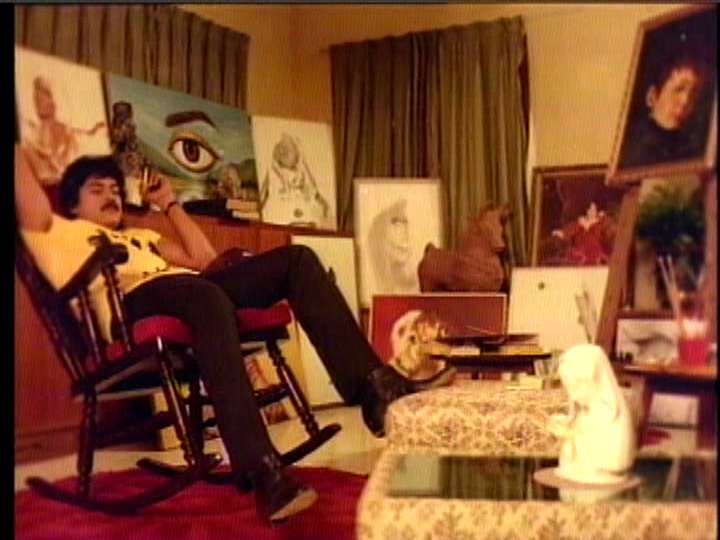 It is a brilliant role for Chiru as it needs his swagger and charisma to make the larger than life Kondaveeti Donga come to life and he makes the most of the less action driven scenes. He wears a nice sheer face mask which fails to disguise him at all, charging around the countryside on his white horse and accompanied by his trusty dog. There are excellent fight scenes, one including tree dwelling ninjas, tigermen and a man with very long metal arms, and a great sequence on a speeding train. There is romance, dancing and eccentric wardrobe as the ladies live out their fantasies in songs with the obliging Raja. He is a decent bloke who genuinely cares about his adoptive family and friends. Even as he surrendered to the police, he took time to give his dog and horse a little goodbye cuddle. Awwwww. And they deserve a hug. The dog is particularly useful as he not only disguises himself as the Kondaveeti Donga on horseback, he also saves his friend the horse from near certain death. There is only one horse stunt that made me cover my eyes so extra points for that too. 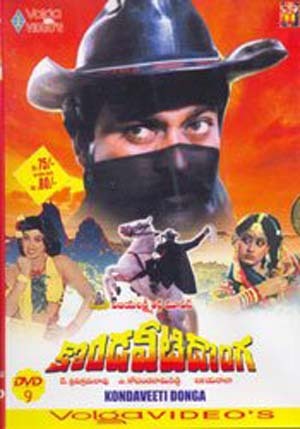 In case Chiru as Zorro isn’t enough to tempt you (what are you – nuts?!?) there is so much more. 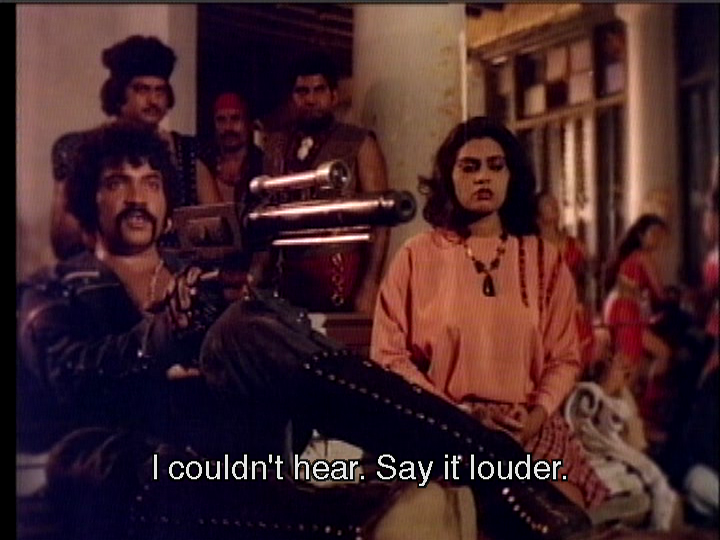 Amrish Puri as an evil mystic with an excellent lair. The symbolism is quite eclectic. The beak on that peacock drawbridge must have been heavily reinforced as it hits the ground with a satisfying thunk. The lair is one of those that can only be reached by water, a long arduous trek or ride, or maybe a brisk walk from the office. There are some geographical inconsistencies that put me in mind of Howl’s Moving Castle. Gadra also has a crocodile pit AND cage full of bloodthirsty cheetahs, and still finds time for his day job. 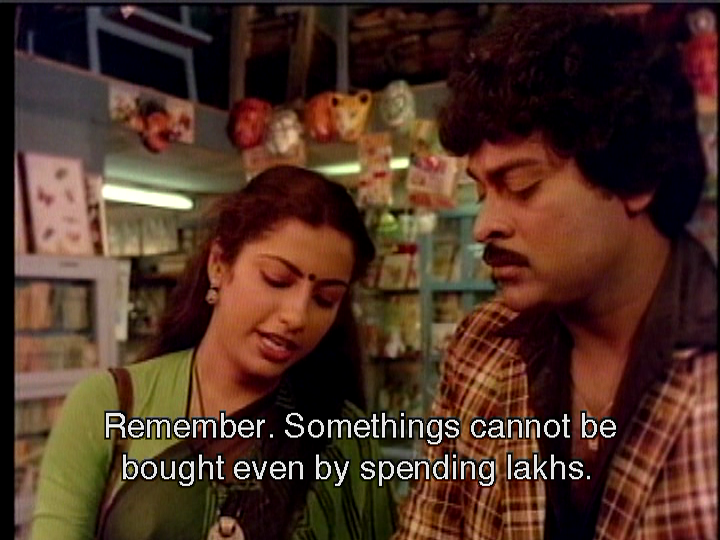 Sharada as a vengeful woman with exacting standards in machete purchasing. I love Sharada’s intensity and she has an elegance that shines through. 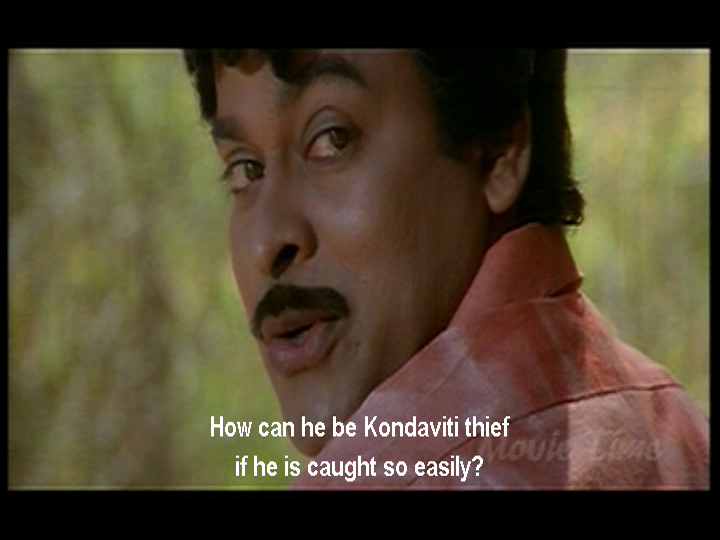 Like Chiru, she can inject a bit of quality into the drama and shenanigans in even the silliest script. Sambhavi is strong, resourceful and driven by a thirst for revenge. 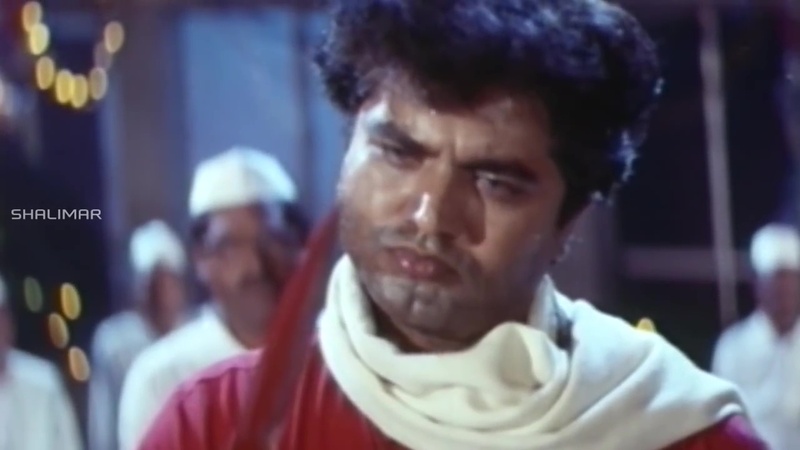 She has an iron will that even Gadra cannot overcome and she does an excellent ‘death stare’ that is almost on par with Amrish Puri. 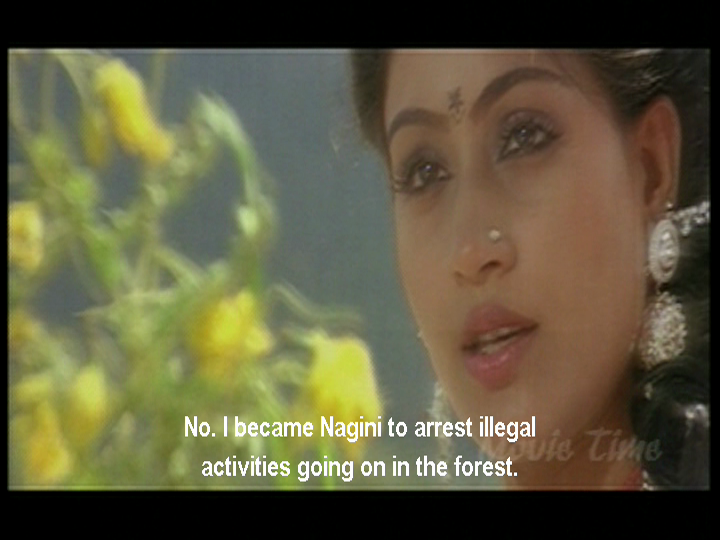 Vijayashanti plays an undercover policewoman who poses as a snake charmer to uncover illegal activities. Srilekha is tough, has tunnel vision when it comes to the law, and is not afraid of conflict. 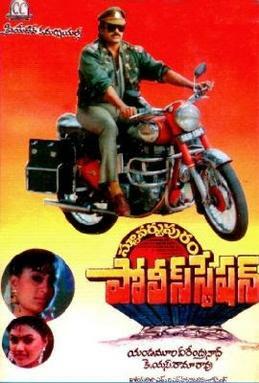 Vijayashanti is great in this kind of role, being pretty and feisty and often very funny. 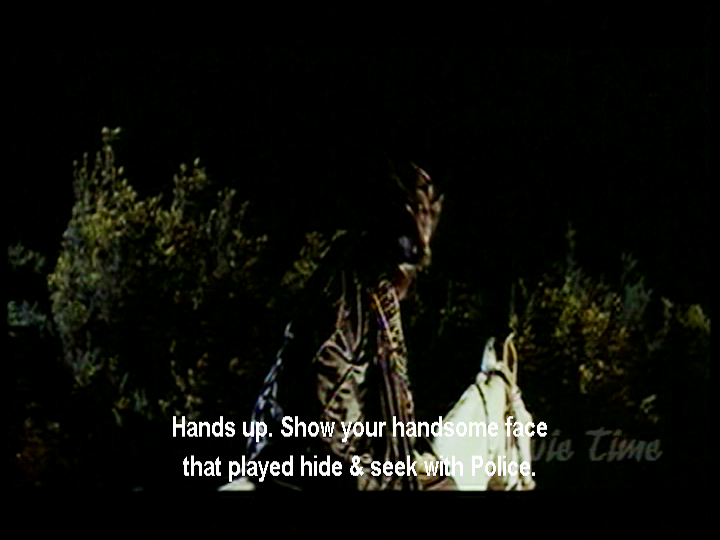 Srilekha doesn’t quite join the dots and see that she is out to arrest Raja, perhaps being too distracted by his charm and laid back dance moves. Srilekha changes, most noticeably when she swaps her snug police uniform for pretty sarees. Ah, the influence of True Love! Radha is lovely as her sister Srikanya. 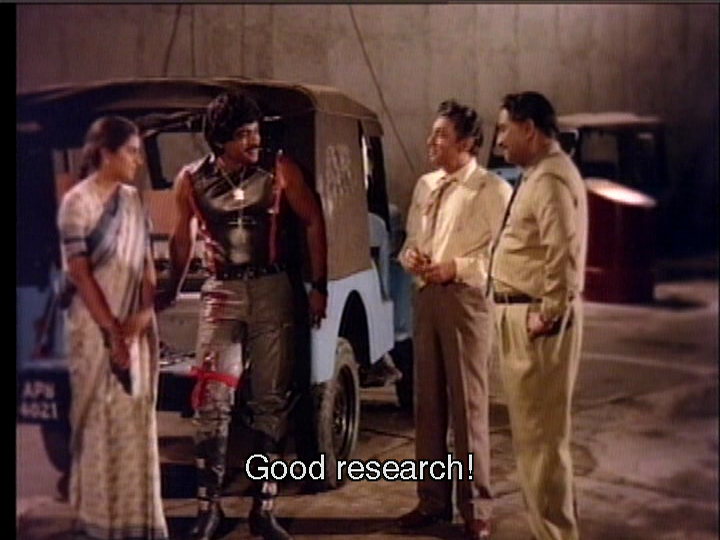 Now Srikanya is a gynaecologist according to the subtitles, but she seems to perform general bullet removal surgery as well as tracking down the reason for so many villagers dying of anaemia (hint – they were literally paying a debt with their own blood). In many respects she is the opposite of her sister; reserved, soft-hearted and girly. But Srikanya is intelligent and independent in her career, so she isn’t just a piece of fluff. She falls instantly and hard for the thief, seeing him as a saviour. 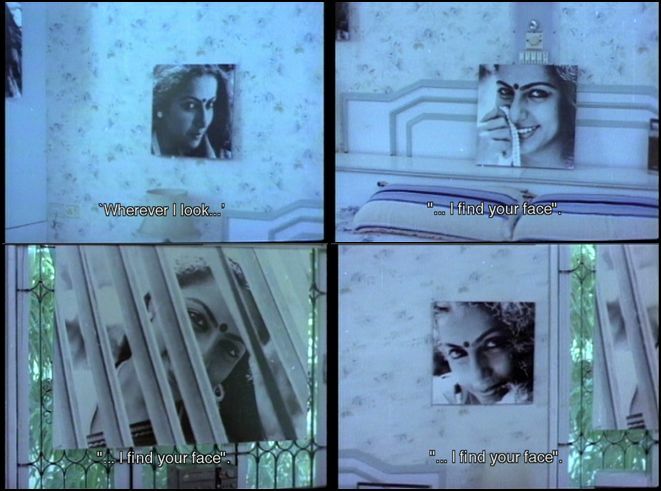 Thanks to a bindi with extra stickum, she works out Raja is the mysterious Kondaveeti Donga. She keeps his secret even from her family as she believes in his cause, and despite being the softer of the sisters she holds her ground under threat. 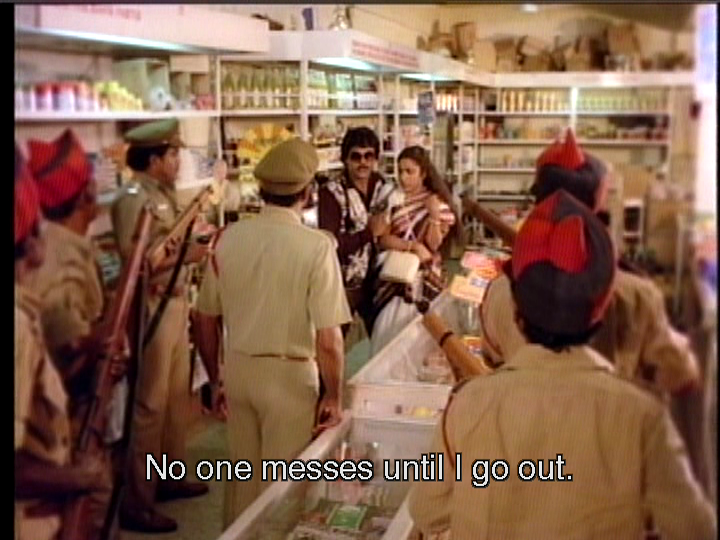 When medical fakery is needed, Srikanya is cool in a crisis. 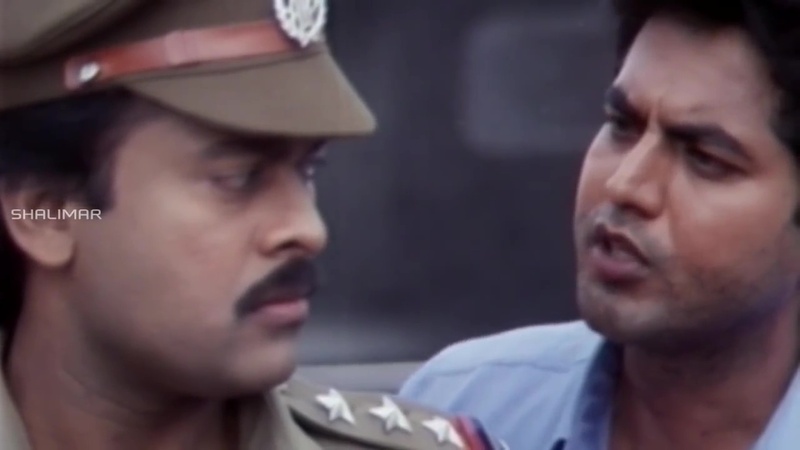 Despite being an unashamedly masala potboiler, there is some nice depth to the ‘good’ characters. 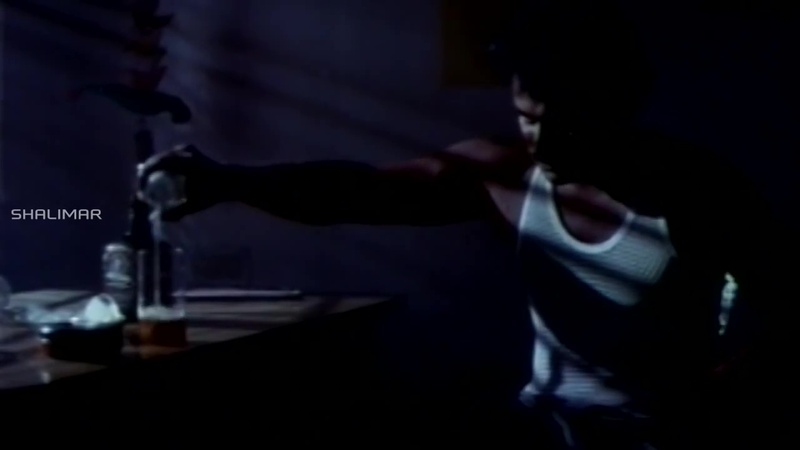 Some key supporting characters find forgiveness and a kind of peace. 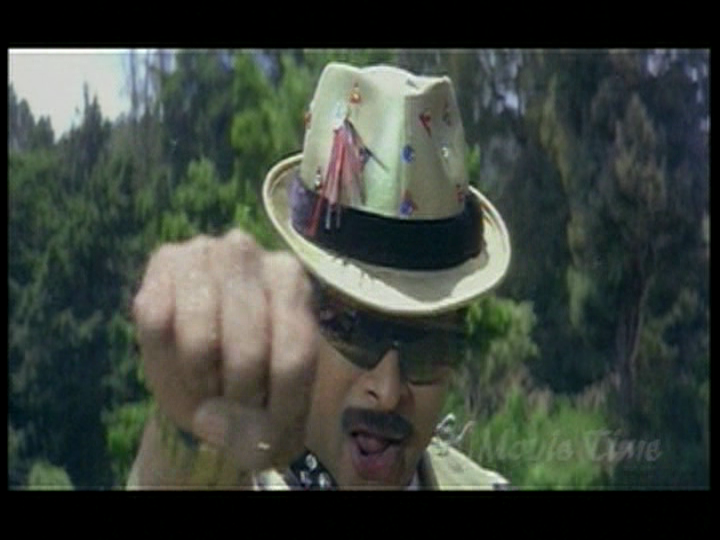 There is a love triangle between Raja, Srilekha and Srikanya. Most of the romancing is confined to the songs which are usually a depiction of the girls’ fantasies. The drama develops between the two ladies, with one oblivious and one heartbroken and all too aware, the romance adding another tension to their already opposing views. Their close sibling bond and strong personalities informed their behaviour not just the love for an irresistible hero. 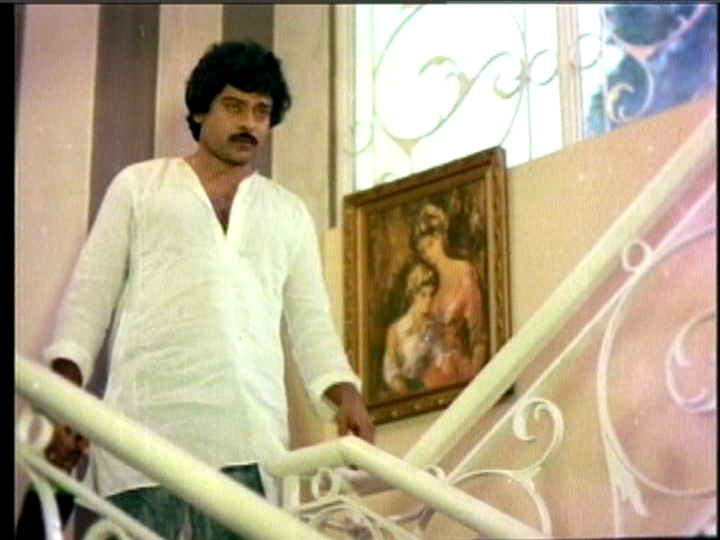 Nagendra Babu plays an enigmatic loner who wanders the wood in search of unseen justice (that’s what he says). 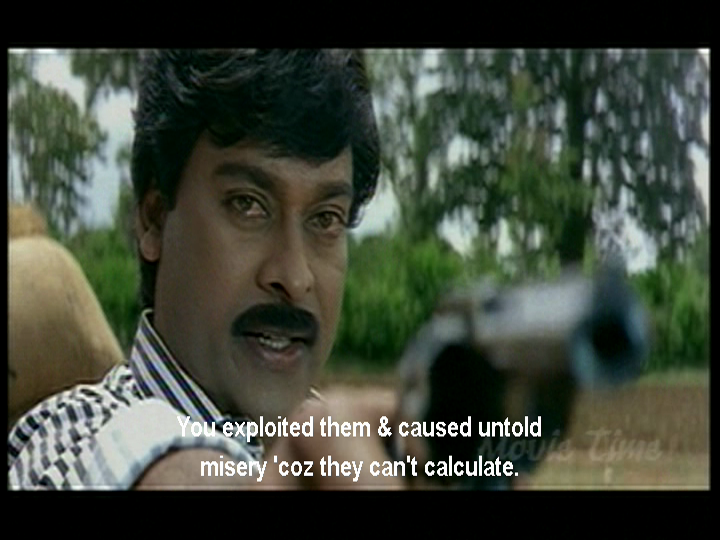 Brahmanandam has a small role and Allu Ramalingaiah plays the crooked subordinate to the bad guys. 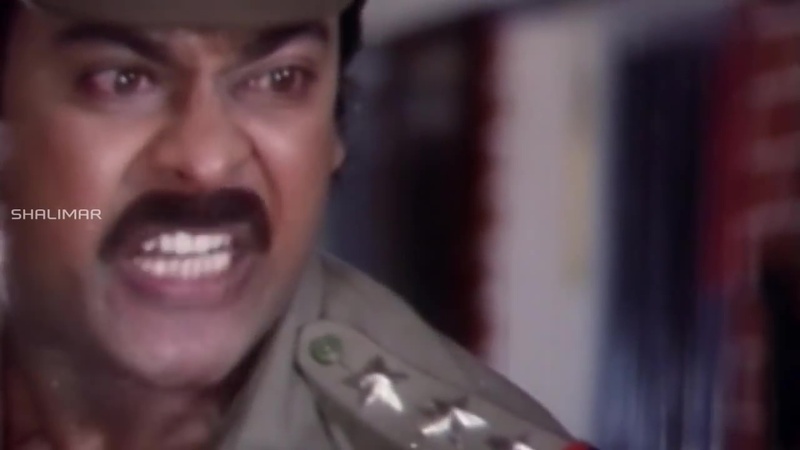 Most of the humour comes from Chiru and Vijayashanti and the naff rapey jokes are left to Mohan Babu and the bad guys. There are lots of small details and symbols scattered through the film and I really enjoyed that extra dimension. 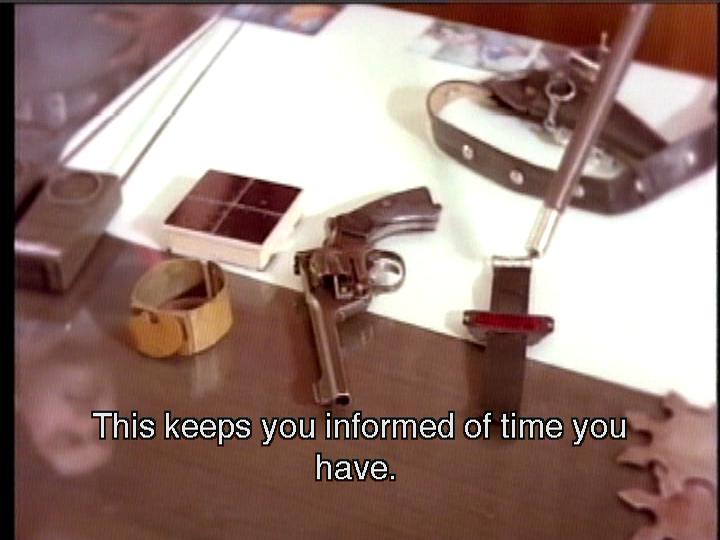 And there were some subtitles that kept me thinking. Often thinking WTF? but thinking nonetheless. 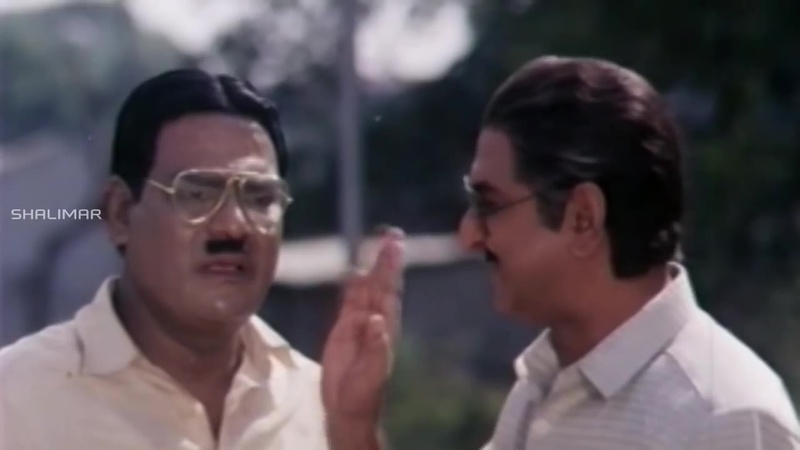 Ilayaraja’s soundtrack is excellent. There is a heroic ‘look out evil-doers’ anthem, some romantic duets and a couple of upbeat sparkly costumed numbers. Something for all occasions! 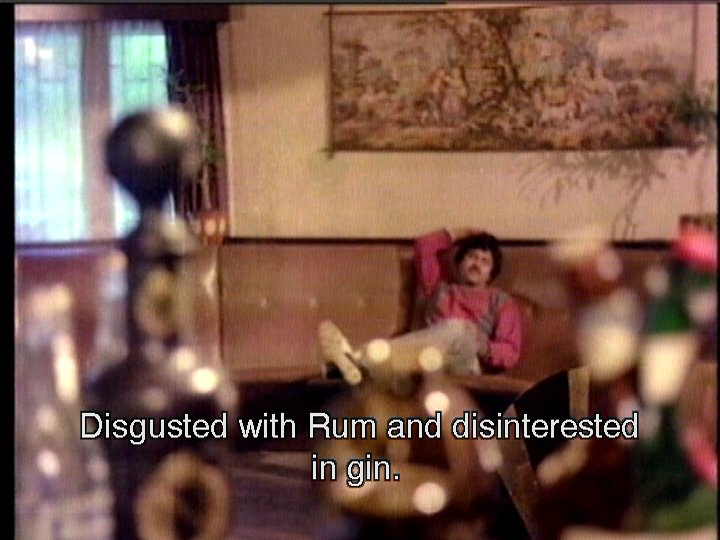 This film has everything I want in masala entertainment. 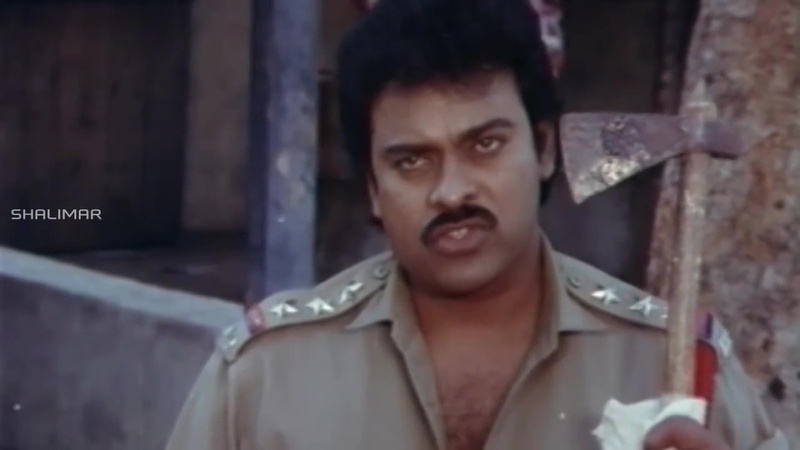 The casting is perfect with Chiru at his mass best, the story rattles along, the action is crazy, and the songs are highly entertaining. 5 stars!